Here at New Blood Art, we like to share investment tips with you and when an artist is on the cusp of gaining additional recognition and value, it’s the perfect time to invest. Glib Franko has just been announced as a Destig Magazine Award Winner – Artist of the year – Europe (Painting). Franko’s work is gaining recognition and likely to see increases shortly, so it’s the perfect time to invest! Somewhat reminiscent of impressionist style – a style known for capturing the emotional essence of a place or thing, Franko’s paintings capture an experience. The work exudes a sense of understanding, of having reached out for that essence of something to bring out in the work. 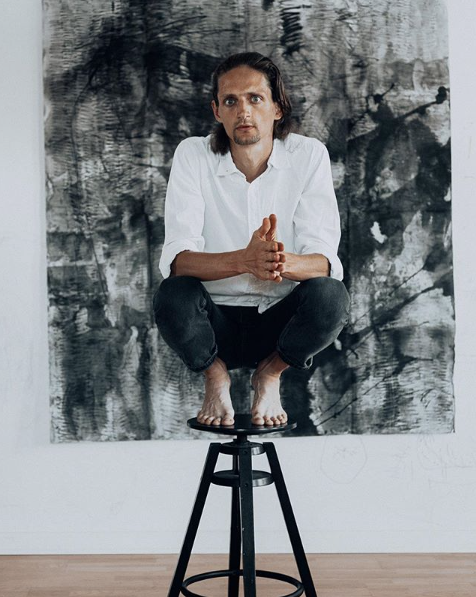 Hi, what’s the title of the painting Franko is sitting / squatting in front of in the photograph alongside the investment tip on your website?